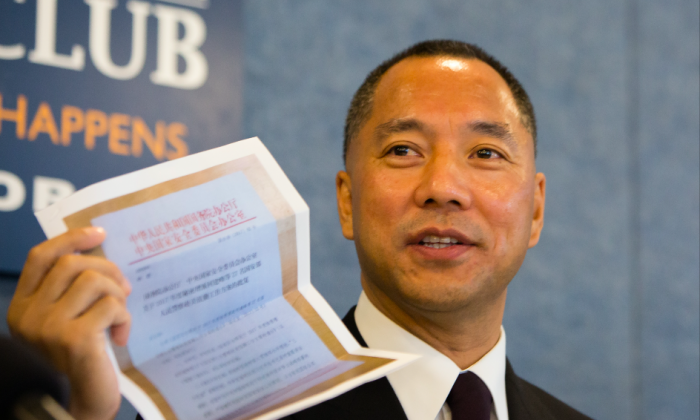 Exiled Chinese billionaire Guo Wengui said on Thursday that the Chinese regime has new covert operations underway that seek to fundamentally subvert the U.S. political institutions and way of life from within. The former business tycoon and property developer was listed in 2014 by the Hurun Report as the 74th richest person in China. After falling out with members of the Communist Party leadership, Guo was accused of corruption and other misdeeds and forced to flee China. He came to the United States in late 2014. Guo now resides in a luxury penthouse in New York City, where he regularly posts tweets and livestreams videos that allegedly contain explosive leaks exposing corruption among current and former top officials in the Chinese regime leadership. His twitter now has close to half a million followers, and his daily tirade against the Chinese regime is viewed by large numbers of Chinese netizens who eagerly follow his latest allegations. In a press conference on Thursday, Guo publicized a document he said is from the Central National Security Commission of the Communist Party of China that allegedly ordered the regime’s intelligence arm, the Ministry of State Security (MSS), to send 27 additional spies to the United States to conduct missions against Guo Wengui and other Chinese dissidents. The order is supposedly part of a massive Chinese regime effort to infiltrate and undermine the United States from within. “Plutocrats in China are implementing comprehensive ‘BGY’ operations against the United States,” said Guo. Guo had previously discussed on twitter and in his videos what he calls the “BGY,” or “Blue Gold Yellow” operations. Blue means internet, gold means money, and yellow means sexual seduction. According to Guo, Chinese regime spies have been using either the internet (hacking), money, sexual seduction, or a combination of the three to compromise and control Americans and American institutions. The document’s authenticity could not be independently verified, although Guo claimed that U.S. intelligence agencies have confirmed that it is real. “What the U.S. ought to do is take action, instead of just talking to the Chinese kleptocracy,” Guo said. Many of Guo’s previous leaks and allegations have been called into question by other dissidents, who say that Guo only seeks publicity for himself and to attack his personal enemies in China by using poorly-fabricated documents. Guo has responded by saying that he had access to the documents and secrets he’s now leaking because he was once a trusted member of the ruling elite of the Chinese regime. Guo was scheduled to speak on Wednesday at the Hudson Institute, a Washington, D.C.-based think tank, in what would have been his first ever public event appearance since exile. The event, however, was abruptly canceled by the think tank on Tuesday without stating any reason. The Hudson Institute has yet to respond to The Epoch Times’ request for comment. In response, Guo’s supporters, including Chinese dissident Yang Jianli and Bill Gertz, senior editor of the Washington Free Beacon, quickly organized a new press conference at the National Press Club on Thursday. Guo claimed that the Hudson Institute’s decision to cancel the event provides further proof that the Chinese regime’s covert influence has reached to and beyond U.S. think tanks. Yang Jianli said on Tuesday that hackers attacked the Hudson Institute’s computers or network prior to the decision by the think tank to cancel Wednesday’s event. Yang said that his own cellphone was also attacked and disabled.